A viral hashtag about female scientists started with listening to the radio. That didn’t sit well with Clancy, whose research has shown that female scientists often endure hostile work environments in the field, including sexual harassment and assault. So she found a photo of her daughter learning the tools she’d use to net and tag birds and added the hashtag, as well as pictures of her research and students. 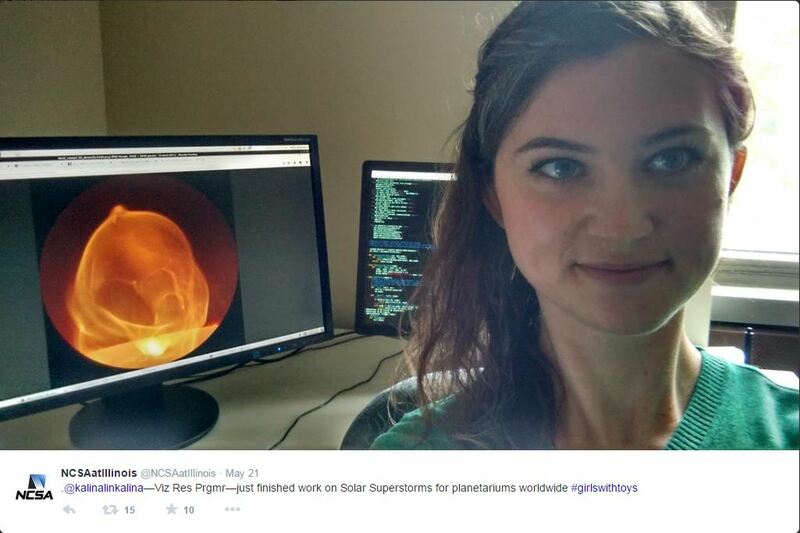 Clancy’s hashtag #GirlswithToys went viral, with more than 17,000 tweets shared in 48 hours. And, in the last month, there have been more than 36,898 tweets using the hashtag #GirlswithToys to highlight women in STEM. At Illinois, our mission is the same on Twitter as it is anywhere else: to foster discovery and to make a significant and visible impact. And, what’s more visible than participating in a viral hashtag campaign that celebrates innovation and upends stereotypes? Once Clancy started the conversation, unit communicators at Illinois joined in. Bill Bell, the executive director for marketing and communications, quickly put together a Storify album featuring scientists from a white-hat hacker and doctoral student in digital forensics to the professor who engineers fluorescent nanosensors to study cancer. The University of Illinois at Urbana-Champaign’s College of Engineering created a Storify album to highlight women in STEM after an anthropology professor’s hashtag went viral. Claire Sturgeon, communications specialist at the university’s Carl R. Woese Institute for Genomic Biology, asked a fellow science writer if she could post photos of her doctoral research—putting RFID tags on bees. 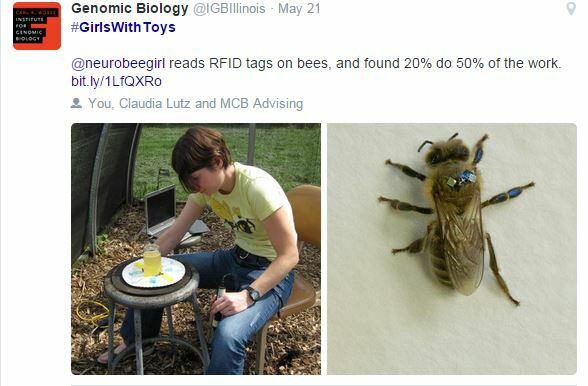 The Carl R. Woese Institute for Genomic Biology posted a photo of a researcher tagging bees with RFID tags, which led to further online conversation about university research. For Illinois’ National Center for Supercomputing Applications (NCSA), using the hashtag allowed the world to know about the impact women at NCSA have had on high-performance computing’s advances in scientific discovery. “STEM, especially the tech side, is seen as a stereotypical male driven field, and for NCSA recruiting and retaining a diverse staff and skill set is a priority,” Elizabeth Murray, media communications specialist at NCSA. Highlighting women in STEM is not only important to the center, she said, but high-performance computing at large. The university’s National Center for Supercomputing Applications highlights women in tech as part of the center’s mission. Of course, it’s not every day that one of your researchers sparks a viral hashtag campaign. There are ways, however, that you can talk about faculty and university research in an organic, conversational way. Research community hashtags. If you’re already following faculty members on Twitter, see what hashtags they’re using. Hashtag communities (much like #casesmc) can be a great way to highlight faculty research and participate in a larger conversation. A paleontologist at Illinois, for example, occasionally tweets out interesting photos of research using the hashtag #FossilFridays. “I keep an eye on #WomenInStem so I think that is the first time I saw #girlswithtoys used, but it wasn’t long before our feed was flooded with #girlswithtoys tweets,” Sturgeon said. Murray said she also uses the hashtag #womenintech, and Clancy’s hashtag continued the conversation from her center’s successful #womenintech campaign from last October to celebrate Grace Hopper month. Be timely. 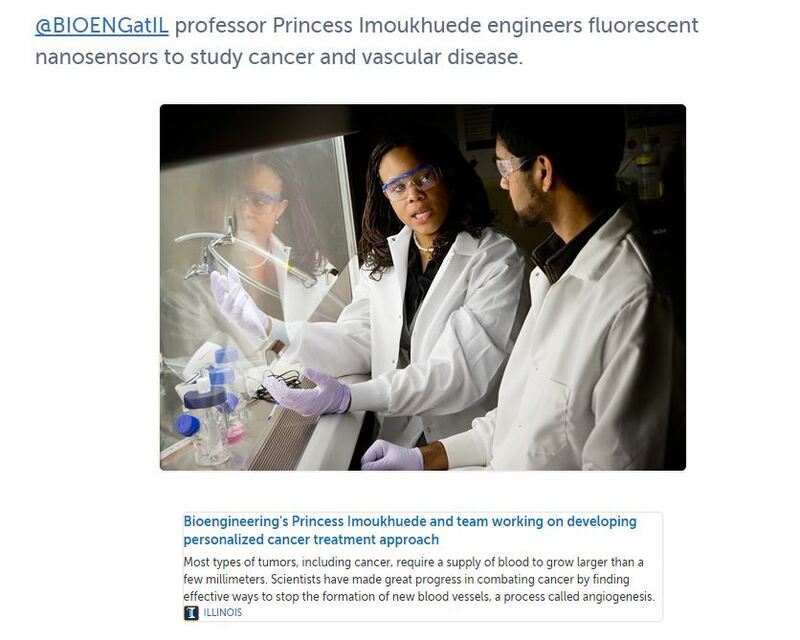 Communicators at the College of Engineering quickly crowdsourced photos of their researchers into a #GirlswithToys Storify album that could be added as needed and shared on other platforms. By putting together a collection of tweets early, the college’s Storify also had the opportunity to get picked up by a Chicago news outlet and reach even more people. New mantra: Archives are your friend. I run the university’s News Bureau Twitter account, which shares information about university research. But I don’t necessarily have regular access to “in the field” photos of researchers with cool equipment like other institutes or colleges. 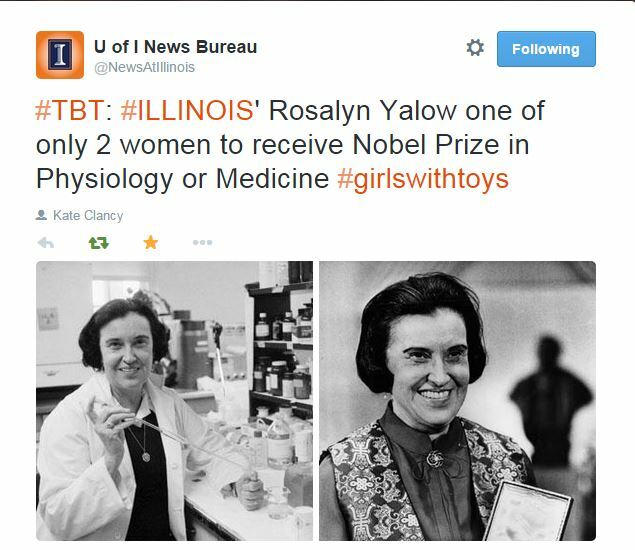 I still wanted to participate in the #GirlswithToys conversation, and remembered that Illinois alumna Rosalyn Yalow was one of only two women to receive a Nobel Prize in Physiology or Medicine. So I posted a photo of Yalow with her equipment and one of her with her Nobel Prize, and tagged with the hashtag. Archives can be a great resource if you don’t have ready access to photos of researchers in the field. Get access to your university and alumni archives or become best friends with someone who does. Archives can create amazing social media payoff—showing the legacy of your institution while also acting as a connection to current research. Contributing to conversations like #GirlswithToys is more than just a tweet to feed the Twitter beast. It’s an opportunity to engage not only with the faculty members that make your institution great, but with future generations of scientists who can find inspiration in your researchers.